Turbula - Music - Review of "Love Filling Station"
Soft-rock journeyman Jesse Winchester has been playing since the '60s and released his first disc in 1970. He has been touring and releasing the occasional disc ever since, and his latest studio disc, “Love Filling Station,” is his first since 1999. Winchester has a high, soft tenor and is a well-respected singer/songwriter of country-tinged music whose songs have been covered by other artists for decades. On this disc, he shows in nine originals and three covers that he can also write and play jazzy and pop music with the facility of an old pro. "O What a Thrill" opens matters with an engaging light country-pop tune, and Winchester's voice can still hit the high notes with ease. This tune alone is better than the crap the Eagles have cranked out in their last couple of trips to the cash register. "Bless Your Foolish Heart" is more of the same. "Wear Me Out" is an understated rock workout, with some licks, a beat and good background vocal support. A brave effort to cover "Stand by Me" follows, with Winchester trapped as many singers with having to mimic Ben E. King's classic phrasing, but deserving an "A: for effort. "It's a Shame About Him" uses a swing jazz beat and jumpy melody to capture one of the disc highlights as a fiddle and guitar back the lyrical story. The slow country ballad "I Turn to My Guitar" works because Winchester has the expressive voice to carry it off, as he does on "I'm Gonna Miss You Girl." Another treat is a cover of "Far Side Bank of Jordan," a country swing that conveys rejoicing and makes use of his impressive vocal range. For "Loose Talk," Winchester teams up with country singer Claire Lynch, who sounds a lot like Dolly Parton. Good idea, except he has to sing too low on the harmonies, and maybe too high on the verses  she sounds comfortable and Jesse is straining. 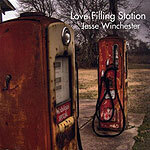 "Love Filling Station" is a solid batch of music from an artist who has been around for nearly four decades, and shows that Jesse Winchester still has the chops as a singer and writer to produce satisfying music. Review by Frank Kocher, a longtime San Diego resident, musician, music collector and frequent contributor to The San Diego Troubadour.